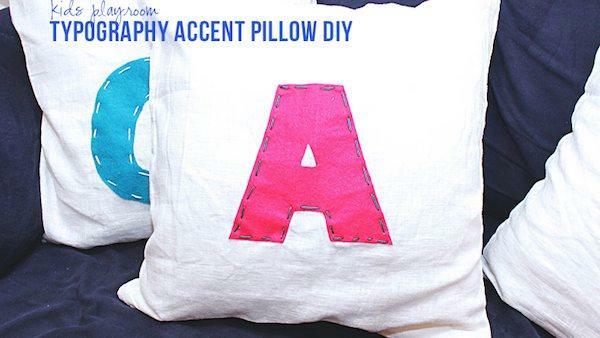 These adorable pillows are an easy no-sew DIY project. Don't pay $30 to $40 for pillows when you can make these at home for so much less and personalize them with your initials, any shape or silhouette! 1. Iron the fusible interfacing (found at any fabric store - it comes in sheets or on a roll) to the felt following the instructions on the packaging. Set aside. 2. On the computer, choose a font you love - the bolder, the better! Enlarge it until you have the size you want. Print out letters and cut them out using regular craft scissors. 3. Place the letter upside down fusible interfacing side of the felt and trace with a marker or pencil. Cut out the letter with fabric scissors. 4. Peel the paper backing away from felt and lay the letter onto the center of the pillow cover, right side up. Iron the letter into place, following the instructions on the fusible interfacing package. 5. You can stop there, but we wanted to add a little extra detailing. Using a contrasting embroidery floss, thread the floss on to an embroidery needle. Be sure to leave yourself a lot of extra floss to work with. Beginning on the inside of the pillow cover, push the needle through the cover and felt, tying a knot at the very end of the floss. Leave a small space, and push the needle back through the felt and cover. Repeat until you've gone all the way around the outside of the letter. Tie a knot in the floss when you've finished. You can customize these cute pillows until your heart's content, and trust us - you won't want to stop!